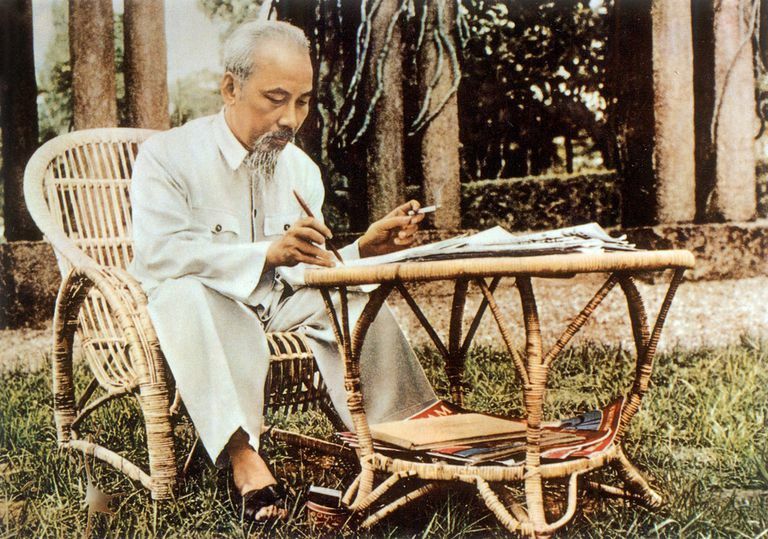 Ho Chi Minh working in the garden of the Presidential Palace in 1957. The causes of the Vietnam War trace their roots back to the end of World War II. A French colony, Indochina (Vietnam, Laos, and Cambodia) had been occupied by the Japanese during the war. In 1941, a Vietnamese nationalist movement, the Viet Minh, was formed by Ho Chi Minh to resist the occupiers. A communist, Ho Chi Minh waged a guerrilla war against the Japanese with the support of the United States. Near the end of the war, the Japanese began to promote Vietnamese nationalism and ultimately granted the country nominal independence. On August 14, 1945, Ho Chi Minh launched the August Revolution, which effectively saw the Viet Minh take control of the country. Following the Japanese defeat, the Allied Powers decided that the region should remain under French control. As France lacked the troops to retake the area, Nationalist Chinese forces occupied the north while the British landed in the south. Disarming the Japanese, the British used the surrendered weapons to rearm French forces that had been interned during the war. Under pressure from the Soviet Union, Ho Chi Minh sought to negotiate with the French, who desired to retake possession of their colony. Their entrance into Vietnam was only permitted by the Viet Minh after assurances had been given that the country would gain independence as part of the French Union. Discussions soon broke down between the two parties and in December 1946, the French shelled the city of Haiphong and forcibly reentered the capital, Hanoi. These actions began a conflict between the French and the Viet Minh, known as the First Indochina War. Fought mainly in North Vietnam, this conflict began as a low level, rural guerrilla war, as Viet Minh forces conducted hit and run attacks on the French. In 1949, fighting escalated as Chinese communist forces reached the northern border of Vietnam and opened a pipeline of military supplies to the Viet Minh. Increasingly well-equipped, the Viet Minh began more direct engagement against the enemy and the conflict ended when the French were decisively defeated at Dien Bien Phu in 1954. The war was ultimately settled by the Geneva Accords of 1954, which temporarily partitioned the country at the 17th parallel, with the Viet Minh in control of the north and a non-communist state to be formed in the south under Prime Minister Ngo Dinh Diem. This division was to last until 1956, when national elections would be held to decide the future of the nation. Initially, the United States had little interest in Vietnam and Southeast Asia, however, as it became clear that the post-World War II world would be dominated by the US and its allies and the Soviet Union and theirs, isolating communist movements took an increased importance. These concerns were ultimately formed into the doctrine of containment and domino theory. First spelled out 1947, containment identified that the goal of Communism was to spread to capitalist states and that the only way to stop it was to “contain” it within its present borders. Springing from containment was the concept of domino theory, which stated that if one state in a region were to fall to Communism, then the surrounding states would inevitably fall as well. These concepts were to dominate and guide US foreign policy for much of the Cold War. In 1950, to combat the spread of Communism, the United States began supplying the French military in Vietnam with advisors and funding its efforts against the “red” Viet Minh. This aid nearly extended to direct intervention in 1954, when the use of American forces to relieve Dien Bien Phu was discussed at length. Indirect efforts continued in 1956, when advisors were provided to train the army of the new Republic of Vietnam (South Vietnam) with the goal of creating a force capable of resisting Communist aggression. Despite their best efforts, the quality of the Army of the Republic of Vietnam (ARVN) was to remain consistently poor throughout its existence. A year after the Geneva Accords, Prime Minister Diem commenced a “Denounce the Communists” campaign in the south. Throughout the summer of 1955, Communists and other opposition members were jailed and executed. In addition to attacking the communists, the Roman Catholic Diem assaulted Buddhist sects and organized crime, which further alienated the largely Buddhist Vietnamese people and eroded his support. In the course of his purges, it is estimated that Diem had up to 12,000 opponents executed and as many as 40,000 jailed. To further cement his power, Diem rigged a referendum on the future of the country in October 1955 and declared the formation of the Republic of Vietnam, with its capital at Saigon. Despite this, the US actively supported the Diem regime as a buttress against Ho Chi Minh’s communist forces in the north. In 1957, a low-level guerrilla movement began to emerge in the south, conducted by Viet Minh units that had not returned north after the accords. Two years later, these groups successfully pressured Ho’s government into issuing a secret resolution calling for an armed struggle in the south. Military supplies began to flow into the south along the Ho Chi Minh Trail, and the following year the National Front for the Liberation of South Vietnam (Viet Cong) was formed to carry out the fight. The situation in South Vietnam continued to deteriorate, with corruption rife throughout the Diem government and the ARVN unable to effectively combat the Viet Cong. In 1961, the newly elected Kennedy Administration promised more aid and additional money, weapons, and supplies were sent with little effect. Discussions then began in Washington regarding the need to force a regime change in Saigon. This was accomplished on November 2, 1963, when the CIA aided a group of ARVN officers to overthrow and kill Diem. His death led to a period of political instability that saw the rise and fall of a succession of military governments. To help deal with the post-coup chaos, Kennedy increased the number of US advisors in South Vietnam to 16,000. With Kennedy's death later that same month, Vice President Lyndon B. Johnson ascended to the presidency and reiterated the US' commitment to fighting communism in the region.